Villa Štefanija is located in the small, peaceful east Istrian village of Puntera, which overlooks the river Raša valley (in Latin, Arsia) at 189 square feet above sea level. A major river of Istria, the river Raša has been famous from the first century when it joined ancient Histrians and Liburns. Just 5 kilometers from Puntera is the charming medieval village Barban. The sea is 20 km away where you can find uncrowded wild beaches such as Blaž, Krnica and Rakalj, unspoiled by mass tourism. Villa Štefanija is surrounded by green plowfields, grazing lands, small hillocks, meadows, caves, and woods, from where you can see a remarkable view of the islands of the Kvarner Gulf, a bay in the northern Adriatic located between the Istrian peninsula and the northern Adriatic seacoast. In the countryside of Villa Štefanija you are completely isolated from urban towns. 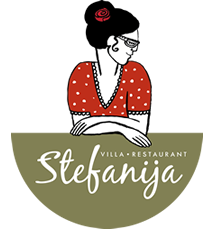 Even if it seems that Villa Štefanija is removed from the rest of the world, it is actually quite close to the biggest Istrian cities, including Pula, Rovinj, Rabac, and Poreč. In fact, our Villa is just 20-30 kilometers (30 minutes by car) from these towns.